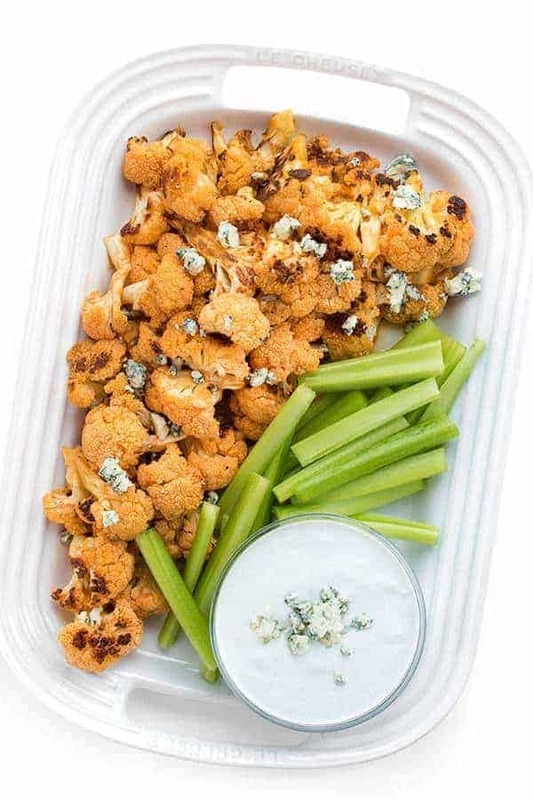 A healthy version of the popular game day appetizer recipe, these buffalo cauliflower bites with blue cheese dressing are packed with flavor, gluten free, low carb and low in calories. Is there anything better in life than appetizers? They’re my favorite dish to order in a restaurant, the first thing I crave when I attend a party and one of my favorite courses to prepare when I’m hosting friends. 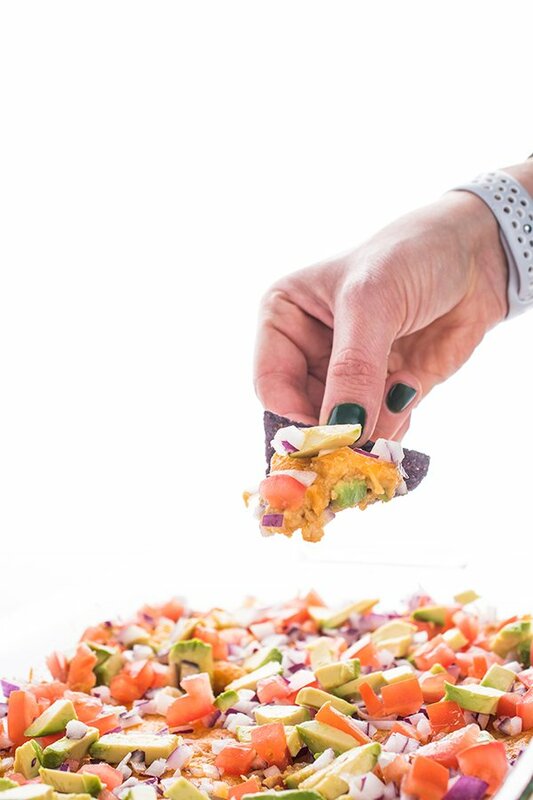 This particular appetizer recipe is dedicated to my dear friend Kristin who loves any and all things buffalo. And who can blame her? Tart, tangy and mildly spicy, buffalo sauce is loaded in flavor. 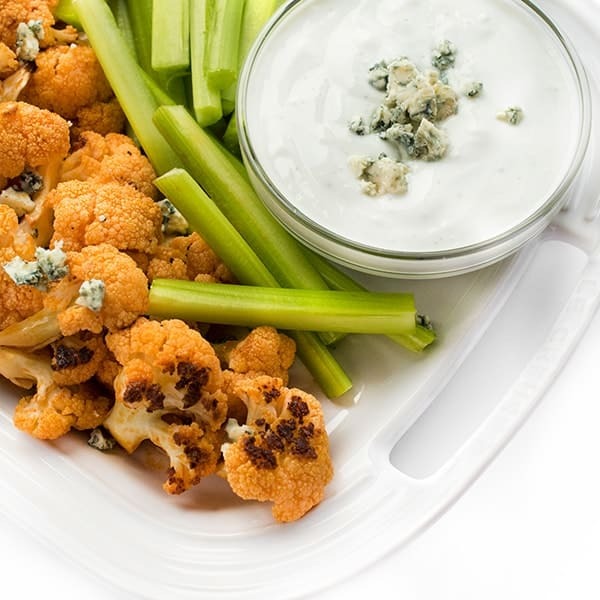 To keep it healthier, I decided to swap out deep fried chicken wings for oven roasted caramelized cauliflower. 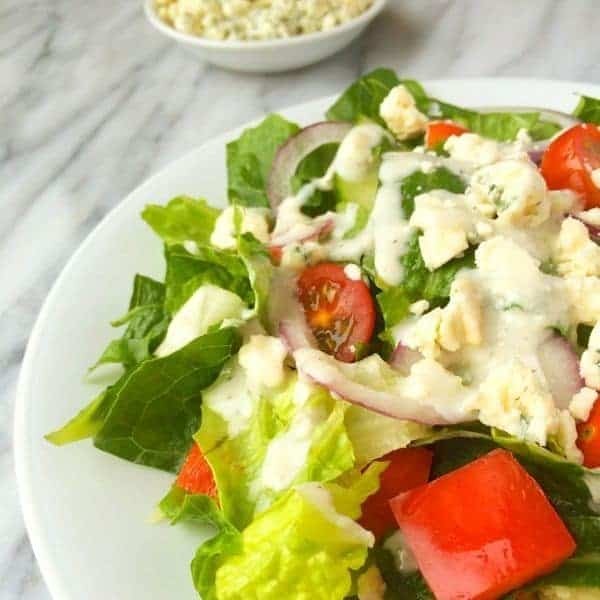 Paired with my creamy blue cheese dressing made with yogurt instead of mayo, it is truly a match made in heaven. I promise you won’t miss any of the missing fat and calories. 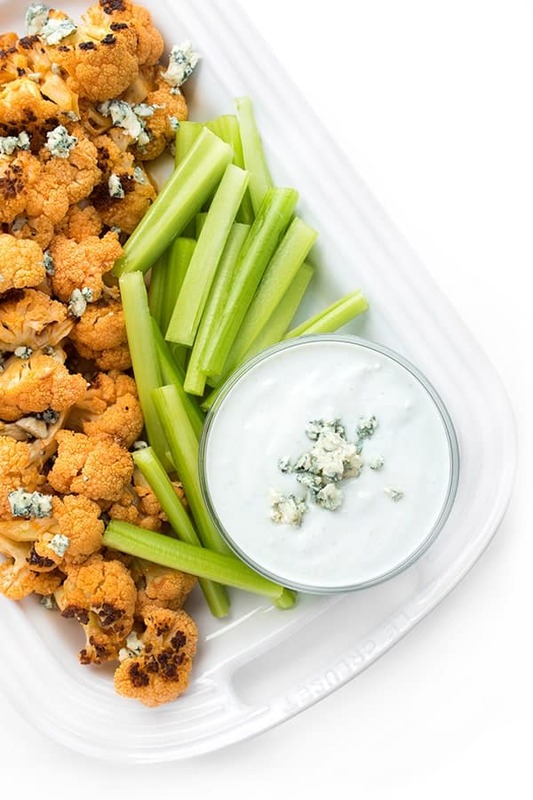 These buffalo cauliflower bites with blue cheese dressing are packed with flavor, gluten free, low carb and low in calories. Pre-heat oven to 400 degrees and line a baking sheet with foil. Spray foil with cooking spray and set aside. In a medium bowl, toss together cauliflower florets with olive oil, salt and pepper. Spread in an even layer on baking sheet and roast until caramelized, about 20-25 minutes. While cauliflower is roasting, melt butter in a small sauce pan over medium heat. Remove from heat and whisk in hot sauce; set aside. Add cooked cauliflower back to the medium bowl and drizzle with the buffalo sauce. 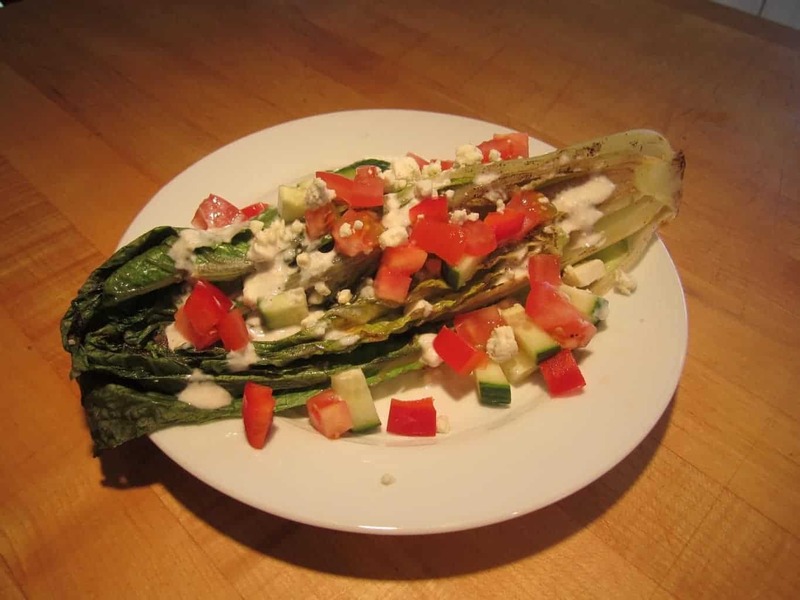 Toss until evenly coated and serve on a platter with blue cheese dressing and celery sticks. My Pinterest board has many more appetizer ideas for you to add to your table! I want this NOW. Looks amazing! I have been craving buffalo wings so hard this week! I love this healthier version. You must make this then! So nice; think of serving it as a side dish for a week night dinner ! 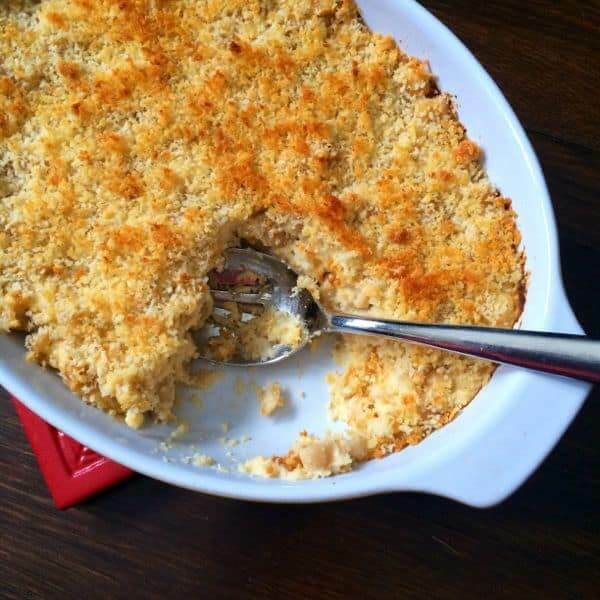 Such a great idea – love the flavors – who would have thought of using cauliflower!!! Brilliant!